One day last week I was trying to decide what to make for dinner that evening. I hadn't been to the store recently, so I was scrounging around in the pantry and the freezer to see what I could use. I think it's good to do that every once in a while, because you find stuff you forgot you had that really should be used up! And that's exactly what happened that day. I was kind of wanting to make a quiche, and have it be our meatless meal of the week. I dug through the freezer to see what I could throw into a quiche. I found a box of butternut squash puree shoved all the way in the back and totally forgotten about. I didn't even remember buying it or how long it had been in there. A quick check of the box revealed that it was still well within its expiration date. Yay! I had never used butternut squash in a quiche, but I thought, "Why not?" I moved my search down to the fridge to see what else I could put in this quiche. I found a container of that Philadelphia Cooking Creme that I bought a while back. The Savory Garlic flavor. I bought it because it was on sale and I had a good coupon, but I didn't know what I was going to make with it. So it sat there for a long time. It was expiring that week. Yikes! Better use that up. 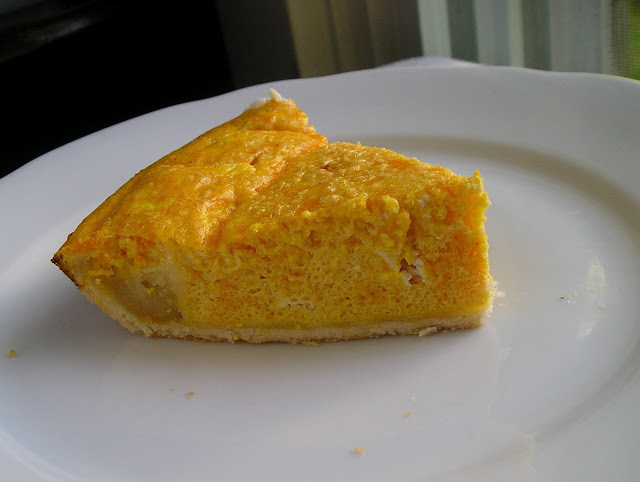 So, using my basic quiche formula (6 eggs and no milk), I added some of the butternut squash and some of the flavored cream cheese, threw it in the oven, and hoped for the best! I honestly had absolutely no idea what was going to come out of that oven. I even spent some time thinking about what sandwich I would order if I had to send my husband down to Subway. I was very surprised when I pulled this quiche out of the oven. It didn't look like my other quiches. For some reason the pie crust edges had kind of folded in and the filling was pretty much covering it all up. But it smelled good and had a very pretty color, so I thought we would give it a try. I forgot to get a pic of it before I cut it. I have decided that the edge problem is cook's error. I must have not pressed the edges against the sides while I was crimping. This quiche is unlike any I have ever had. The consistency is completely different, but it was really good! It turns out super light and fluffy. The combination of flavors is amazing too. The slight sweetness of the butternut squash with the garlic cream cheese is amazing. I wasn't sure what my husband would think of it, but he raved about it. My four-year-old liked it too. I was very surprised to find that this was one of my more successful kitchen experiments! Preheat oven to 350°. Remove pie shell from fridge at least 15 minutes before using. Spray a pie plate with nonstick spray, then carefully roll out pie shell. Fold over and crimp edges. In a medium bowl, lightly beat eggs. Add squash puree, cooking crème, and salt. Mix well. Pour into pie shell and bake 40 minutes, or until quiche is set in the center. Remove from oven and let cool 10 minutes before cutting and serving. Now I kind of want to try this with pumpkin puree! I agree, Lesa. Successful kitchen experiments are the best. This looks delicious. So unique! And delicious looking! Kind of like a souffle.